This blog post was first published on June 19 2011, and revised and updated on June 12 2015. May be derived from the Latin almus, meaning “nourishing” – an epithet given to several Roman goddesses, including Ceres. Alma mater, meaning “nurturing mother”, is a Latin term often used to refer to one’s college or university: it was originally a title given to mother goddesses, and later to the Virgin Mary. The obscure 4th century Romano-British saint Alma Pompea, married to the semi-legendary King Hoel of Brittany, is an early example of the name. The name was given a boost after being used in Sir Edmund Spenser’s 1590 poem, The Faerie Queen; he seems to have been influenced by the Renaissance Italian word alma, meaning “soul”. The name became popular in the 19th century, after the Crimean War began with the Battle of Alma, when Anglo-French forces defeated the Russians near the River Alma – the river’s name is from a Tatar word meaning “wild apple”. After this date, babies of both sexes (but mostly girls) were named Alma in honour of the military victory. Alma was #24 in the 1900s, and #97 in the 1930s, leaving the Top 100 the following decade, and the charts in the 1960s. Alma made a mild comeback in 2011, and seems very contemporary, as it has been used in Brokeback Mountain and The Hunger Games. Already popular in Europe, Alma would make an interesting alternative to names such as Amelia, Anna, or Emma. Pet form of the Anglo-Saxon name Etheldreda, meaning “noble strength”; it was the name of a 7th century English princess and saint whose feast day is June 23. It became less common after the Middle Ages, because St Audrey Day Fairs sold low-quality necklaces that were disparagingly called tawdries – which is where we get the word for something cheap and tacky from. Audrey was revived in the 19th century when the Victorians rediscovered many Anglo-Saxon names. The name was already familiar, as Audrey is the simple but honest country girl in Shakespeare’s As You Like It. The Victorians were also in the middle of a Shakespeare revival, so Audrey was a dead cert for a comeback. Audrey was #156 in the 1900s, and peaked in the 1920s at #32. The name was #36 in the 1930s, but plummeted so that it was off the Top 100 by the following decade. It fell to a low of 0 in the 1980s, but climbed after the death of Audrey Hepburn until it reached the Top 100 again in 2008. Once tawdry Audrey now seems charming and stylish, and is currently #44 and climbing. Often said to be a pet form of Elizabeth, but technically a pet form of Elspeth, the Scottish form of the name, and was originally Elspie. The name Elsie can be found in songs and poems dating to the 17th century, and became a 19th century favourite. Elsie was #7 in the 1900s, #59 in the 1930s, and left the Top 100 in the 1940s. Elsie left the charts in the 1970s, but returned in the early 2000s at #731. It joined the Top 100 in 2013 at #91, and last year rose 26 places to #65 – an impressive performance. Sweet and unpretentious, Elsie is very much back in the game. Named for the hedgerow tree or shrub which produces edible nuts; the Celts equated hazelnuts with wisdom and poetic inspiration, and the Druids made staffs from hazel branches. It was considered to be one of the trees belonging to the fairies, and folk tales tell of its ability to protect from evil. Hazel has been used as a personal name since the 17th century, mostly for girls, and became popular in the 19th century when plant names were fashionable. Hazel was #45 in the 1900s, and peaked in the 1910s at #18; by the 1930s it was #55. Hazel left the Top 100 in the 1940s, and the charts by the 1970s, making a return in the late 2000s at #477, after Julia Roberts named her daughter Hazel. Last year Hazel had an outstanding debut as the fastest-rising name of 2014, rising #63 places to #88. One factor must surely be the romantic film The Fault in Our Stars, with its heartbreaking heroine Hazel Lancaster, although there have also been Hazels in the Heroes of Olympus series, and Gossip Girl. Greek personification of the rainbow who served as messenger to the gods, and linked them to humanity. The name literally means “rainbow”, which is where the colourful iris flower got its name from – and the colourful irises in our eyes. Irises were used in the Middle Ages as a symbol of monarchy, as the fleur-de-lis pattern depicts. Religious pictures from the medieval period show the Virgin Mary holding an iris to symbolise purity and chastity. Filled with meaning and associations, the name was used by the 19th century British aristocracy for both females and males (because the Greeks called the iris flower a “hyacinth”, and Hyacinth was a male name), but quickly became used by all classes, and nearly always for girls. Iris was #62 in the 1900s, and peaked in the 1910s at #31; it was #72 by the 1930s. Iris left the Top 100 in the 1940s, and left the charts in the 1970s, although it returned in the 1980s at #748. Off the charts in the 1990s, Iris came back in the early 2000s at #551, and is now around the mid-200s and apparently stable. Almost always on the charts, Iris manages to be a “normal” name that is still underused. Hip and artistic, it has slightly dark or even punk undertones. It’s a floral name with a bit of bite. Anglicised form of Joséphine, a pet form of Joséphe, a French feminine form of Joseph; by the 19th century Joséphine had become the standard form of the name. It has been used by several of the royal houses of Europe, and is famous as the first wife of Napoleon Bonaparte, and thus the first Empress of the French. Joséphine was born Marie Joséphe, so it was the pet form of her middle name. Classic Josephine has always been on the charts. It was #86 in the 1900s, peaked in the 1910s at #76, and by the 1930s was #78. It left the Top 100 in the 1940s, and sunk to its lowest level in 2011 at #199, so it has never been out of the 200s. In 2012 it made an appearance again in the Top 100 at #93 after the birth of Princess Josephine, the daughter of Australian-born Princess Mary of Denmark, but has since stabilised into its usual place around the mid-100s. Josephine is a solid stayer with royal blood whose nicknames range from the sensible Jo to the cute Josie to the tomboy Joey to the froufrou Fifi to the cool Joss. Refers to the emotion of extreme happiness and gladness. It was originally a Puritan virtue name dating from the 16th century, referring to rejoicing for the salvation of God – perhaps most famous from the hymn, Joy to the World, now often used as a Christmas carol. In fact, joy and Christmas have become so entwined that you could even see Joy as a name suitable for a baby born around late December. However, the name Joy has become secularised, and often linked to the joyful experience of welcoming a child into the world: babies have even been called “bundles of joy”. Joy entered the charts in the 1910s at #205, and was in the Top 100 by the following decade. It peaked in the 1930s and ’40s at #60, and left the Top 100 in the 1960s. Joy reached its lowest point in the 1990s at #802, but then increased slightly in popularity, and was stable in the 500s for some time. Its current position is not known for sure, but is in at least occasional use. Quite common in the middle position, Joy is a strong, simple name with a beautiful meaning, and the current trend for virtue names mean that it would be refreshing to see it up front. Most likely a pet form of Elizabeth dating to the Middle Ages: there is a medieval Scottish ballad about a lady named Lillian. The name became greatly more popular in the 19th century, to the point where it could be seen as another Victorian revival of a medieval name, and may have been understood as an elaboration of Lily, which also became fashionable in the 19th century as a flower name. Lillian is a classic name which has never left the charts. It was #35 in the 1900s, reached #86 by the 1930s, and left the Top 100 in the 1940s. It reached its lowest point in the 1970s at #562, and then climbed steeply, following in the footsteps of Lily, until it reached the Top 100 again in 2008 at #81. It is currently #86, so its position is stable. However, the high number of Lilys and Lillys (not to mention the Laylas and Lolas) mean that lovely Lillian may feel almost too on trend for some. French form of Maria: in France it has sometimes used for males, especially as a middle name, but in English-speaking countries is almost always feminine. The name often reminds people of Queen Marie Antoinette, whose first two baptismal names were Maria Antonia – she was Austrian by birth. In the Middle Ages, Marie was commonly used in England, and predates the use of Mary. The medieval poet Marie de France lived and worked in England, possibly at the court of King Henry II – it is even thought that she may have been Henry’s own half-sister. The traditional English pronunciation of the name was MAH-ree (still used in the 20th century), but it is now usually said muh-REE. A name never out of common use for centuries, Marie was #71 in the 1900s, and peaked in the 1930s at #11 – perhaps Irving Berling’s hit song Marie, sung by Rudy Vallee, was an influence on its success at this time. Marie left the Top 100 in the 1960s, and fell off the charts in 2011. It is now only in occasional use, although a common middle name. Marie is still popular in Europe, and this is a pretty, traditional name that still seems very wearable. English form of the Roman name Oliva, which refers to both the olive tree and its fruit. There is a legendary Italian martyr called Saint Oliva, known as Blessed Olive. The Crusaders introduced the name Olive to England in the 12th century; returning from the Holy Land, they often gave their children names of Biblical import in honour of their religious duty. Olives play a major role in the Bible, from the dove bringing an olive branch to Noah after the Flood, to Christ ascending to Heaven from the Mount of Olives. It was a name used for both males and females, and in fact I have seen a baby boy named Olive in the past few years – but overall Olive has been more common for girls. Olive became popular in the 19th century, along with other plant names. Olive was #26 in the 1900s, and was #73 by the 1930s. It left the Top 100 in the 1940s, and was off the charts by the 1960s. It returned in the late 2000s, after Australian actress Isla Fisher chose the name Olive for her eldest daughter. After a smooth rise, Olive joined the Top 100 in 2012, debuting at #94. It is currently #76, so rising sedately rather than steeply. Buoyed by the success of Olivia and Oliver, and with a V in the middle like other popular names, Olive should continue to do well. People’s favourite names were Hazel, Iris and Josephine, and their least favourites were Joy, Marie and Alma. 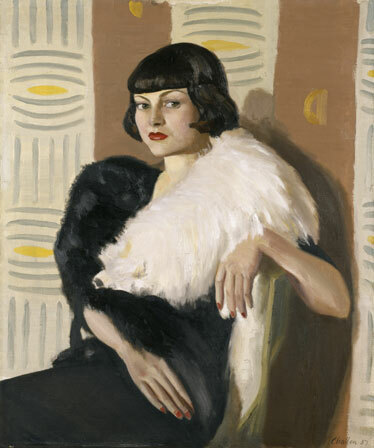 (Painting is Moira Madden, later Moira Hallenstein by Arthur Challen (1937); from the State Library of Victoria. I’m looking for a name for the girl in my picture book. This is a great sight that will continue to come in use. Thank you! And I hope you find the right name for your book. Found your intriguing site indirectly due to a Google alert. As a children’s author, I try to use names in my stories which have symbolic links. PS Recently told that a Philbert (filbert) was a cultured hazel nut! Wow, this is an unexpected honour! I now realise I should have added a link to your personal website in the blog entry, which I have edited to include it. You’re quite right that a filbert is (I think) a European species of hazelnut. They are apparently called that because they become ripe around St Philibert’s Day (August 22). Philibert itself means “dear, beloved”. Great list. I love a lot of these. What a wonderful list! I love both Josephine and Olive, although my sister insists that she dibbed Josephine when she was 8. I think that the majority of names on thislist will work for little ‘uns these days, especially Audrey, I’ve seen lots of them running around recently.